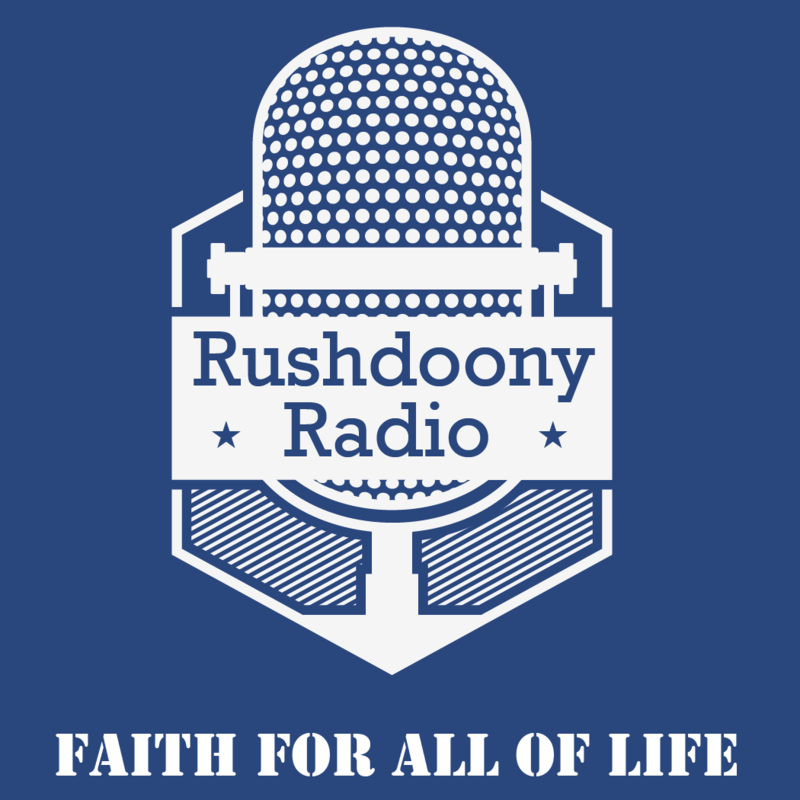 R.J. Rushdoony: 00:00 On our final session before we have questions and answers I’d like to deal with change. The constitution and the people. In discussing change it is important to note that in philosophy and oncology it means potency. In Aristotle power is the source of change and the capacity to perform. For us as Christians we believe as Psalm 62:11 declares, “God has spoken once, twice have I heard him say this, that power belongeth to God.” Both Aristotle and scripture agree on the ultimacy and importance of power, they differ in it’s location. For Aristotle it is not in the personal God whereas for scripture power belongs to powers. R.J. Rushdoony: 02:14 Some years ago I heard a prominent federal bureaucrat, an economist, so called. We were both on a panel at this college conference. He had been of power and the administration of Truman, of Kennedy, and of Johnson. He very earnestly made the statement that if the federal government would only follow his economic ideas, he said, “We can have our cake and eat it too.” Well no such miracle is possible, not even in Washington. R.J. Rushdoony: 03:11 I find myself fairly regularly criticized on insisting on the necessity of Christian schooling for Christian children, for criticizing Social Security and other things. These criticisms come from evangelical church men. They’re not as common as they once were. In the ’50s and ’60s and even once in the ’70s, if I spoke of the necessity of a Christian schooling, by parents are a Christian school of Christian children, some minister would stand up and denounce me as trying to subvert the soul saving task of the church. Which they would say was the only task which should concern the church. Thank God we’ve improved a great deal over the years, but enough of that attitude still remains and as a result we have today, an ineffectual church. It’s members are content to live in terms of a humanistic world six days a week and they fail to see how offensive they are to God almighty. R.J. Rushdoony: 04:40 Power has been transferred by the people to the state. Our present regimen has been voted in by the people. There’s another transfer and the courts have sanctioned it and this transfer has been from our elected representatives to bureaucracies. Congress has sanctioned it also. Whenever Congress meets they pass a number of laws, their laws will fill one or two bookcases, those of the bureaucracy, each year would more than fill this room with book stacks all through the building. Complaints against these bureaucrats are quite common place but they’re empty, they are meaningless because bureaucracies exist in churches and in business and in other areas of the so called private sector and their powers are very great. There is scarcely any church of any size today that is not ruled by a very powerful bureaucracy. In some instances churches with no more than 10 and 20,000 members from coast to coast have a very top heavy bureaucracy. R.J. Rushdoony: 06:23 All this is a part of the surrender of power. The bureaucracy claims to be made up of experts who can manage us. One writer has said and I quote, speaking of the civil bureaucracy, “Power is only exercised in a legitimate way in the United States when it rests on a consensus among a variety of elites including the higher civil service.” This writer Nelson [Hulsvey 00:07:05] feels that power is shifting, legitimate power in the United States towards elite experts in the higher civil service and bureaucracy, so that while the Congressmen and the Senators and Governors still have the lime light, power has moved out of their hands and they have surrendered it. R.J. Rushdoony: 07:36 Our Justice Macklin Fleming, one of the great California Judges of a few years back, declared that certain things happen when we surrender power to an elite or to a bureaucracy. He said first universal coverage in a transcendental application is claimed by the state and it’s parts. Well this has been true in recent years. Since 1950 all kinds of trifling cases have been decided by the courts. On the student revolution of the 1960s, while professing to rebel against that, actually confirmed and made possible a great deal of it. R.J. Rushdoony: 10:10 Now we may feel that some of the trifles over which students went to court represented too much regulation by the school but by going to court, what they did was to trivialize the importance of the law and to give them universal jurisdiction so that even where we might agree with something we have to say the whole procedure was wrong and fundamental destructive of justice. Today trivialization is common in all spheres. In the churches most of the things that the church courts deal with are trifles. Hereasy, unbelief, and immorality get less attention in most churches than offending the church leaders. Within this past week I heard from a very fine young man, a very successful man, a man who was giving very generously to the church, and other Christian causes, by the thousands of dollars. He came to realize that there were many of the young men of his age whom he knew who were ignorant of Christianity and didn’t get much of it from church and Sunday school, if they started to attend and many of them were not even remotely near attending but were interested. R.J. Rushdoony: 12:03 He organized them in a home bible study and began to say, “This is what the bible teaches, this is what Genesis is about and this is what Exodus is about, we’ll have a little survey each week then we’ll concentrate on one of the gospels so that you can understand the meaning of salvation, the meaning of Christian responsibility and so on.” The pastor called him in and told him that he had to cease and desist. The young man in all innocence said, “I didn’t know I was violating any church rule. If you want to assign one of the assistant pastors to take over that group, I’m ready to have him come in. But I didn’t find any interest when I inquired about it and I felt that I could reach these young people whom I know. I knew them as students, we’re in the same community still, I know them from my work and I want to reach them for Christ.” That was rejected and he was told, “It is not your prerogative to tell us what to do, you will perhaps be happier in another church.” That’s trivialization. R.J. Rushdoony: 13:33 This is by no means an unusual incident but a very, very common one. In fact I could write a book of all the instances like this that I’ve had reported to me and I’ve usually checked them out by talking to someone in that particular community, but in my travels, these are routine. A trifling church means a trifling nation. Trivialization is commonplace. Take family problems, do you know that most of the troubles between husbands and wives and most of the fights are over trifles? Most ridiculous trifles imaginable. I saw this while I was still a student and it was the depression. There was these two students who got married and both came from families of means, great deal of means. So they had a big church wedding in Berkeley with over 1,000 guests and a very lovely apartment provided by the father of the groom. They were very much in love. R.J. Rushdoony: 15:05 But, within a short time the marriage broke up, when the war broke out it created terrible problems for them. He would come home from his office, at his fathers place of business and when he was going to wash up for dinner, there were her nylons hanging over the towels. In those days they were rationed, they were scare and women took very good care of them and he would fume that he couldn’t wash his hands and face and then dry himself without wading through her hosiery. She would fume because after he used the toilet he left the seat up. Well, that little fight went from one item to another and to increasing bitterness until they did all kinds of ugly things to get even with each other before they got a divorce. Life has been trivialized because we begun by trivializing the faith and minimizing it. R.J. Rushdoony: 16:20 It used to be that before you could be a voting member of a church you had to be knowledgeable. A lot of churches had catechisms, the Presbyterians sued to go by the Westminster catechism. You had to know 164, 74 questions and answers by heart. It used to be you were drilled on those and children were too. They knew what they believed. I would doubt that Presbyterians even know today that there was such a thing as a catechism in their church. We’ve trivialized church membership, the bible, everything. A communist who left the party some years ago, when he was converted was horrified because he said, “When I joined the cell,” and I used to have his copies of [Marx’s 00:17:25] writings, he was a long shore man. He had underlined and studied in order to be able to pass the stiff series of examinations to become a communist. Nobody asked him a question when he was taken into a church and he was shocked. And then not at all surprised that the church was at so low an ebb of power. R.J. Rushdoony: 18:04 Obviously there has to be a change and it must begin in the Christian community. The early church was a persecuted and illegal body but in terms of 1 Corinthians 6 when Paul says, “How dare you go to the pagan courts, aren’t there wise men among you to adjudicate matters?” They set up courts. Very quickly because their courts became famous for their justice, even the pagans were coming and saying, “Look if we go to a Roman court we have to wait years to get our case settled.” There was one case where they waited over 40 years and the widow finally went to the Emperor and the Emperor ordered the court to solve it immediately, to settle it. He did within a week and the Emperor said, “If you could solve it in a week when you sat on the estate for 40 years plus, you’re not the kind of judge I want,” and he ordered him executed, but it didn’t change the other judges. R.J. Rushdoony: 19:18 Christians came to be the courts of the Empire, people knew they could go to them and get justice in terms of God’s law. This is why when Constantine became Emperor, and made Christianity tolerated, he told the bishops, “From now on I’m ordering all of you to wear the garb of a Roman magistrate when you’re out int he street so that any Roman knows he can go to you for justice because our judges can’t provide it.” That’s where our bishops garb comes from, it’s the garb of a Roman magistrate but I don’t think there’s a bishop in the United States who knows what his garb means. R.J. Rushdoony: 20:19 This is not all they did. In terms of what God required in his word, they took care of widows and orphans and the needy. They set up orphanages and schools for the homeless boys, they set up old folks homes, they set up housing for travelers, Christian travelers because in those days, the non-Christian hotels and motels or whatever they called them, inns, were also houses of prostitution a girl came with a room and you had trouble getting rid of her and if you got rid of her they’d send in a boy figuring you were one of those. So Christians could not stay in the inns outside of Judea. They established hospitals, schools, infirmaries for the aging without families and so on. R.J. Rushdoony: 21:25 Christians by the use of their tithes and offerings created a shadow government which was more powerful than Rome. Even as they were being persecuted. R.J. Rushdoony: 21:44 That was the real government of the United States, the Christians and all the agencies they had set up. That’s why the Constitution had some validity then. Let us remember another fact, according to Numbers 18:25 and 26, a tenth of the tithe went to the priest, that is for worship, perhaps another tenth went to the musicians. This meant that most of the first tithe was handled by the Levites or what we today would call Christian reconstruction. To reorder society in terms of the law of God, on top of that you had the poor tithe every other year, another tenth. Thus the tithe provided for a variety of governmental social services. R.J. Rushdoony: 22:51 Social services must be provided, if not by Christians then by the state. It is immoral if we complain about taxes and then fail to tithe and help create and support Christian agencies not only in the sphere of worship and education but health and welfare. If we tithe we have the power in our hands. We have the power to change men and society and power must be exercised under God because all power is rightfully from God. We can not surrender it, but because we have today, we have the omnicompetent state. R.J. Rushdoony: 26:45 Sovereign means absolute power, total control. Today the Supreme Court and other agencies routinely speak of the sovereign power of the federal government. You can not restrain a sovereign by law. That’s an ancient legal maxim going deep into English legal history, European legal history and church doctrine. Supreme power limited by law is a flat contradiction in terms as John Austin pointed out in the last century. R.J. Rushdoony: 27:31 Thus, there is no way you can say the Constitution can limit the federal government any longer. Once we accepted the doctrine of state sovereignty and federal sovereignty we said they can not be controlled. A sovereign can not be controlled, there can be no God over God. For us, God the father, God the son, God the Holy Ghost alone is the sovereign in all creation. Therefore there can be no law governing God, he is the source of all law and if you make the federal government sovereign as has been done, it can never be bound by any Constitution or any law. R.J. Rushdoony: 28:29 Do you know that in the Carter administration a law was passed requiring a balanced budget? Graham [Rodman 00:28:41] required it. The Graham Rodman bill. Both have been nullified. We’re talking about amendments now to require a balanced budget, that’s a joke. How can you have any amendment or any law to chain down a sovereign? That was the greatest gift the framers gave us, they refused to use the word sovereign or sovereignty to describe the federal union which they created and in that they broke with every other country on the face of the earth. That’s the most unusual, the most unique thing about the constitution, it is an instrument which does not claim sovereignty for the federal government. R.J. Rushdoony: 29:43 That meant it was to be under law. Under God. He eliminated that. R.J. Rushdoony: 29:58 This is the battle in the early church, Rome was ready to say, “We’ll grant you freedom of worship. All we ask of you is that you register your church at a government center and say Caesar is Lord. That is, Caesar is sovereign.” The answer of the Christians was, “Jesus Christ is Lord over Caesar, not Caesar over Christ.” It is for that they died. R.J. Rushdoony: 30:30 That’s what the persecution was about, more than one Emperor bagged them to accept one of them had his officers tell the Christians, “Look our Emperor thinks the world of your Jesus Christ, he even has a statue of him in his private chapel. Why don’t you say Caesar is Lord?” But now we have said, “Caesar is Lord.” Not Christ and we’re paying the price for it. R.J. Rushdoony: 31:07 As a result the Constitution today is no defense. It is only faith in the sovereign and triune God and in obedience to his law word which can deliver us. Man can not live by bread alone or by Constitutions now by election victories nor by tax revolts, but only by every word that proceeds from the mouth of God. We must therefore return to a full orbed and unqualified faith in the sovereign God we must cease to treat the faith as something that applies only to our selfish, because if we do so, we are denying the faith. R.J. Rushdoony: 32:07 As I flew back from a trial at the other end of the country Tuesday in the evening, I testified in the morning, heard the state attorney declare the bible was a child abuse handbook. I sat next on the trip, on the second half of the journey out of Chicago, next to a woman who is an officer in one of the top “Evangelical” organization in the country, located not too far from this area. She wanted to know what I was reading and why and when she found I was a Christian she started to tell me, “You know we must be alert as Christians today because there’s a tremendous evil at work in the churches.” She hadn’t recognized my name and she said, “It’s all this lordship and dominion teaching and preaching.” Well I didn’t tell her what my relationship to that was but I said, “Well I’m a very strong believer in that.” I told her about the word Lord in the Old Testament and New Testament and its meaning and how we can not make salvation the be all and end all, it’s just the starting point of our life in Christ. R.J. Rushdoony: 35:10 She said, “Well no.” She said, “I know a lot of them who are truly, wonderfully saved and they’re still on drugs.” And she went into one who was such a marvelous Christian, according to her but thirteen years and still on drugs. I said, “He isn’t saved.” There is nothing in us, in our lives, no matter how evil we were before we came into contact with Christ that is not too strong for him to overcome. I said, “Some years ago I was instrumental in the salvation of a man that had three generations die of alcoholism in his family.” And he was now an alcoholic. R.J. Rushdoony: 37:31 I said, “Chet forget about the goodbyes, you’re a strong man and I can see how those six men had trouble holding you down. If you’d have been sober they probably couldn’t have done it.” But I said, “You’re a weakling compared to the new man in you Jesus Christ. It is against the old man, Jesus Christ, the old man Chet doesn’t have a chance. Now go home and sleep and forget about this problem because the new man is Lord in your life and you haven’t got a chance against him.” And I was right. I told her that story and she got up and moved to another seat. R.J. Rushdoony: 38:19 I went back to my book. That’s our problem today. We have too many who are calling people converts who are just running away from hell and how are scared to death at what their drugs or something else is doing to them. We are making their problem worse by deluding them to believe that they are Christians. R.J. Rushdoony: 38:54 I heard recently from a pastor, who wrote to me and he said, “You know, I’ve always thought of myself as a great soul saver, and I could count the numbers by the thousands who came forward because of my preaching.” He said, “Recently somebody gave me a book by Spurgeon and it shook me to the foundation of my being and I realized why all those converts were so weak and worthless.” He said, “Now I’m going to let God do the saving. I’m just going to be the instrument. And I’ve seen his power make a difference.” Well that’s what we need, the sovereign God, the sovereign Christ, the sovereign Holy Spirit work in us and through us to bring every area of life and thought into captivity to Jesus Christ. R.J. Rushdoony: 39:58 When we do that neither Moscow nor Washington has a chance because Jesus Christ is Lord and every knee shall bow and every tongue confess it. Either in faith or as they face him in judgment. They haven’t a chance, the only problem is, on which side are we going to be? In his army, or a dead weight that has to be disposed of? Are there any questions now? Speaker 2: 40:40 Question and answer period, it won’t take number five.